From legendary tone arms to unique hardwood plinths, the GrooveMaster series is highlighted by one unquestioned fact: Each and every one is a stand-alone work of art…in design, engineering, and impeccable craftsmanship. We can draw on the finest sources for each phase of construction, with a versatility that leaves our patrons amazed. We welcome your special challenge! (below left) One of our original GrooveMasters, customized with stainless steel banding. 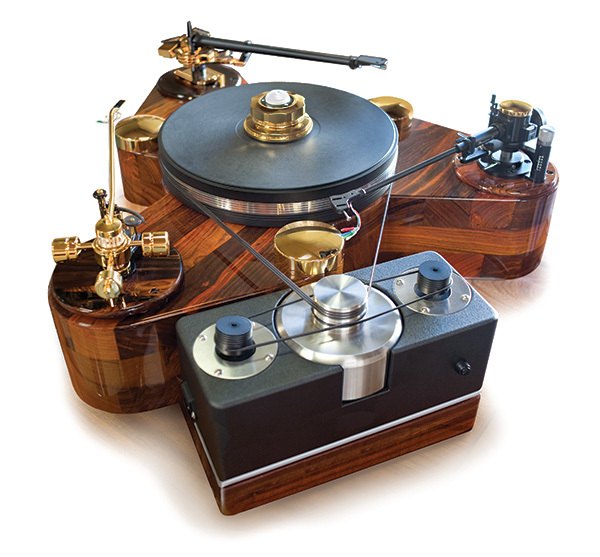 (below right) This DN7 marvel features a solid copper platter and the most expensive tone arm/cartridge ever installed on a turntable. The tone arm owner would accept only the best – and called PBN Audio. HARDWOOD PLINTHS: Our three-layered, form-aged solid hardwood plinths for the GrooveMaster Series turn heads wherever they are displayed. Made from individually selected and matched planks, very pore, every growth ring, each burl or eye-pleasing irregularity is brought to vivid life in deep, liquid-like finishes. The 120-degree angles that offset each layer create resonance-free stability as well as spectacular grain patterns. Make no mistake; each is an original piece of woodcrafting art – and the perfect base for producing rock-solid, flawless music.